Never mind Blue Monday; boot January into touch with the new issue of American Car Magazine. Start with a pair of hot Mopars, neither being the usual suspects, one newly finished and the other a concours-winning race champion! Add a '55 Chevy that really runs the numbers thanks to a mega-cube of motor. Throw in a Brit who went to Utah to learn how to drive a Mustang FR500S, reports from LA and Autosport International, plus all the usual goodies and you've got the recipe to banish winter and get ready for show season. 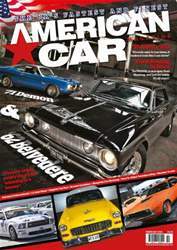 Have a happy new year with the February issue of American Car Magazine, out now.